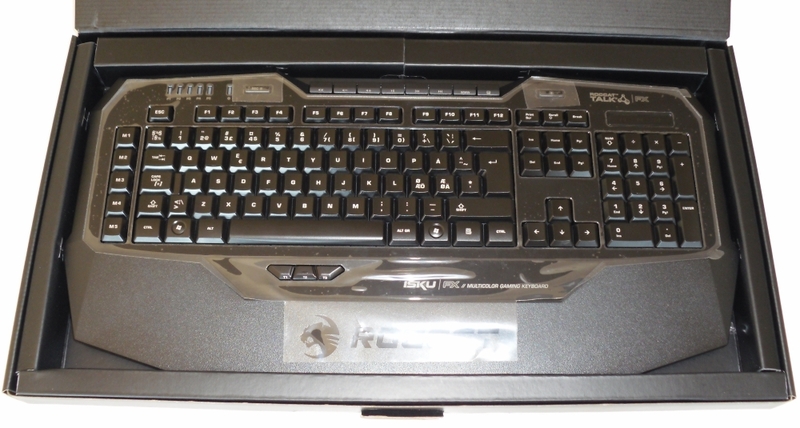 As with all other ROCCAT products, the ISKU FX keyboard comes in very nice packaging. One could get the impression that this keyboard will be able to have backlight of three different colors at the same time, but this is not the case. 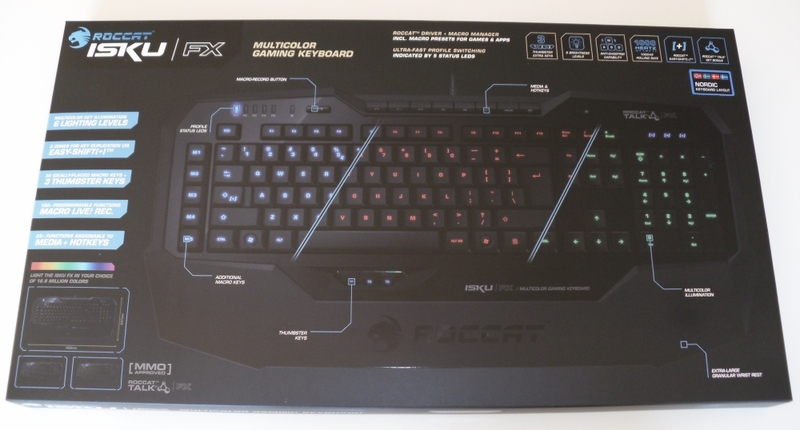 The ROCCAT ISKU FX is, however, capable of producing backlight of any RGB color you could want, which is what they have tried to show with the different colors on the front of the box. On the back side is highlighted some of the main features of the keyboard, which gives a good overview of what to expect. One key reason to get this keyboard is its ability to store plenty of extra macros by the smart use of Caps Lock as the ROCCAT Easy-shift[+] button. The keyboard itself comes in a large anti-static bag, which has been removed here. When it comes to size, the ROCCAT ISKU FX is somewhere in the medium range. Not too big and bulky to fit on a desk with limited space, but neither too compact to include the thumb buttons and a nice wide wrist-rest. First impression out of the box is that this keyboard is not unnecessarily heavy, but does reflect the additional weight from added features compared to a low budget one. The mix of a slightly textured base frame with an inlaid glossy top plate, works very well. A USB cable of 2m length is plenty for most users, and is of course equipped with ROCCATs own USB plug. There is no braided surface on the cable, as this is mainly used for mice, but instead a normal cable of good quality. Since the ROCCAT ISKU FX does not have neither built in USB hub nor sound jacks, it has been possible to use a thinner cable. 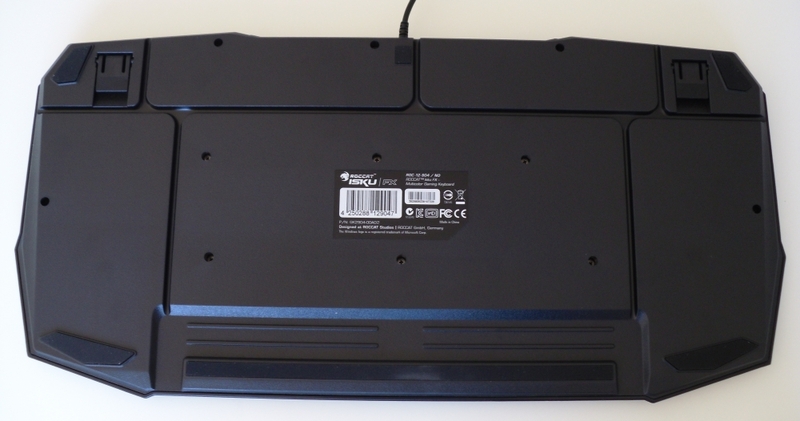 On the back side we find several large rubber pads with the purpose of keeping the keyboard placed firmly on most desks. These are definitely working as intended, as the ROCCAT ISKU FX stays put even under intense battles. This is mainly due to the long rubber foot along the wrist-rest which manages to keep the grip even if you choose to use the fold-able feet for greater height of the backside. A nice extra little feature is that ROCCAT have cut grooves in the bottom of the keyboard for your other cables. This is quite handy for especially headset cables, providing a new alternative to get rid of those. With very responsive keys, although membrane keyboards can never really compare to scissor or mechanical keys, the ROCCAT ISKU FX manages to deliver on what gamers expect from their keyboard. The claim of a 1000Hz polling rate with a resulting response time of just 1ms is hard to verify, but probably is one of the reasons behind the high responsiveness of this keyboard. The height of the keys is very important for most users, and basically comes down to a matter of preference based on what you have been used to. With their “Medium-height” keys, ROCCAT manages to exploit the best from two worlds in the ISKU FX. The slightly reduced height, compared to some other keyboards, reduces the travel distance and thereby the time it takes to activate each key. Users of keyboards with normal key height will easily feel at home with the ROCCAT ISKU FX, as the distinctive top surface curvature and key spacing is kept. Included in the box is a CD with the driver, which can also be downloaded directly from the ROCCAT website. 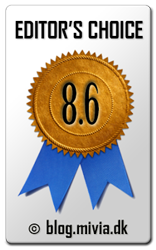 If you get the one from the website, you are sure to get the latest version. If you are lucky enough to also have a ROCCAT mouse supporting ROCCAT TALK, you should go ahead and get the driver allowing your peripherals to communicate with each other. This can be downloaded from the official ROCCAT TALK support page. 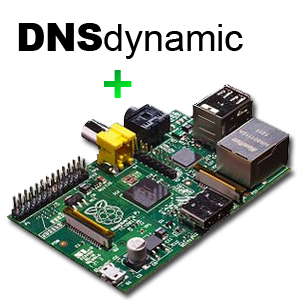 The keyboard will work right out of the box, without any driver installs, but to get the nice features and settings it is required to install it. The driver program delivers a ton of customization options, which will be more than enough for the average gamer. Whether you just want to change the backlight color and deactivate the annoying windows keys, or have the desire to set up an arsenal of fine tuned macro keys, you will have the tools available to do so. 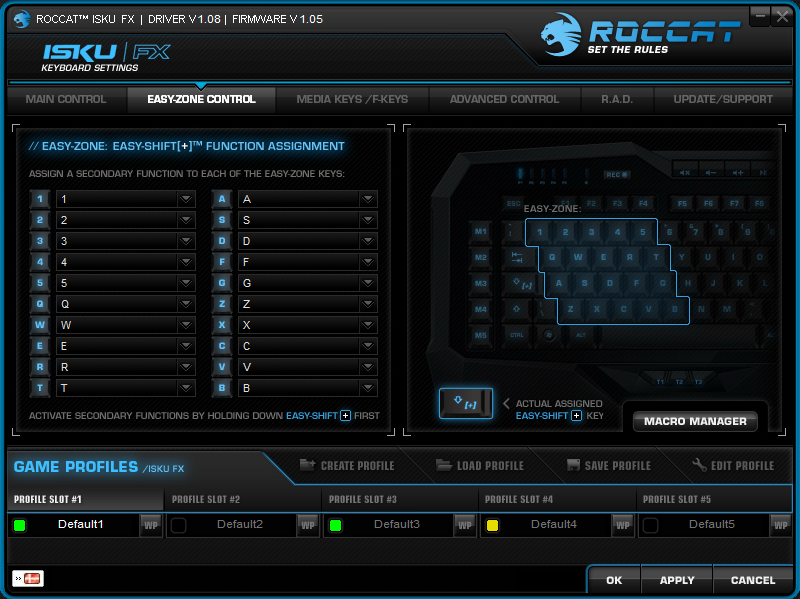 A vast amount of customization settings is definitely the main strength of the ROCCAT ISKU FX, but the customary ROCCAT achievement system (R.A.D.) is a nice addition. Whether you want to make your achievements public with the ROCCAT community, or just monitor key press statistics on your own, is up to you. A gaming keyboard should be packed with nice features, which is something the ROCCAT ISKU FX delivers very well. Compared to other brands of keyboards in the same price range, this list of features is quite extensive. While quite a few companies are aiming for the gamer audience with feature rich and high quality gaming peripherals, it is not all of them who manages to pull it off as well as ROCCAT. With the recent addition of several new models to their product line, ROCCAT aims to provide gaming gear to a wider audience with varying preferences when it comes to everything from key types to layout, price range and customization needs. The ROCCAT ISKU FX is a good gaming keyboard for the average gamer who wants to have some of the more advanced customization options available. An extensive list of features including easy recording of macros makes this above-average keyboard worth its above-average price. If you don’t plan on using macros and can live without the illuminated keys, then you will probably be fine with a cheaper alternative. 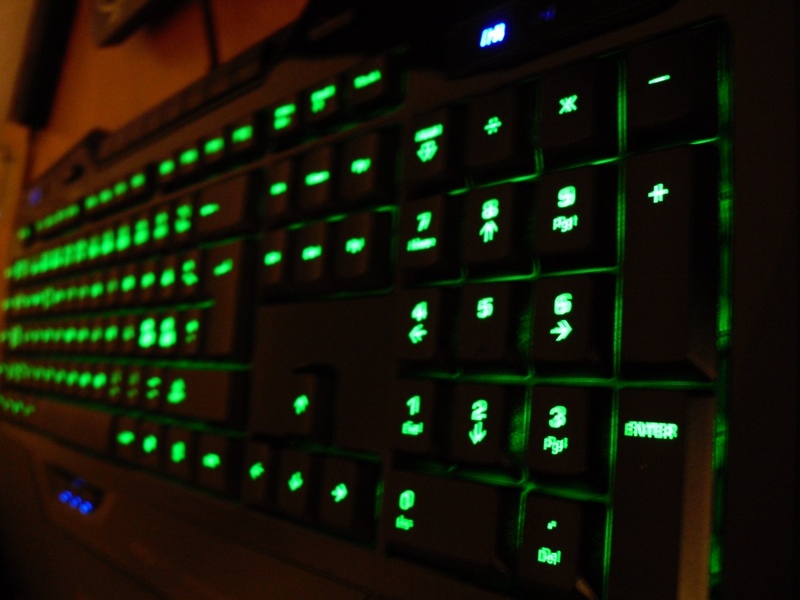 However, where is the fun in a gamer keyboard if it does not come with a load of hi-tech features? 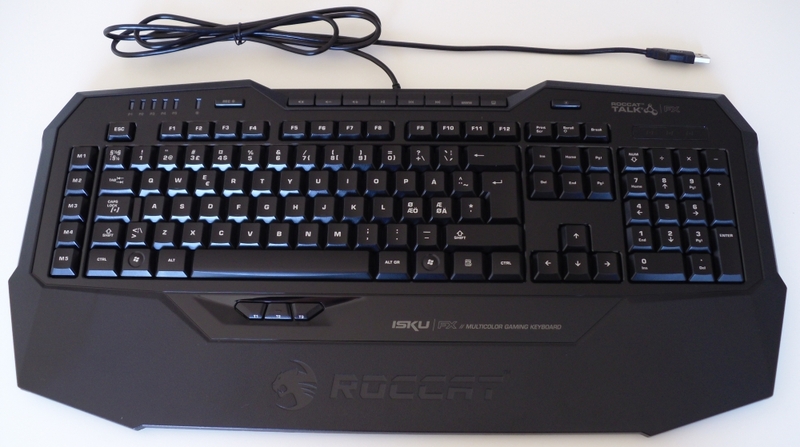 Mivia’s blog highly recommends the ROCCAT ISKU FX! 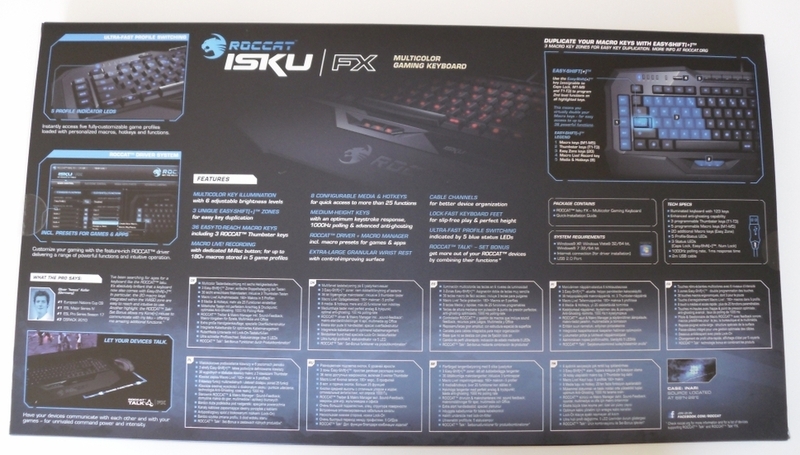 More details can be found at the official ROCCAT ISKU FX webpage. By Mikkel at December 6, 2013 .